The syndromes of small fiber neuropathies (SFN) affect thinly myelinated Aδ-fibers and unmyelinated C-fibers, which are assessed by a range of techniques including cerebral potentials evoked by noxious electrical, laser, or contact heat stimuli. These specialized neurophysiological techniques contribute to the diagnosis, monitoring, and evaluation of treatment effects in SFN and understanding their pathophysiology. The standard clinical neurophysiological tests (nerve conduction studies, NCS, and somatosensory-evoked potentials, SSEPs) assess large myelinated Aβ-nerve fibers and their associated pathways in the central nervous system (CNS), hence may be normal in SFN. Nociceptor dysfunction assessment with electrical stimuli has been used in organs such as tooth pulp, which are exclusively innervated by small fibers, mainly to investigate the efficacy of analgesic agents in acute experimental pain. Laser-evoked potentials (LEPs) are obtained after rapid heating of the skin with laser pulses, can help to identify lesions of small sensory nerve fibers and/or their CNS pathways, and represent a sensitive, objective, and noninvasive method for the assessment of SFN. 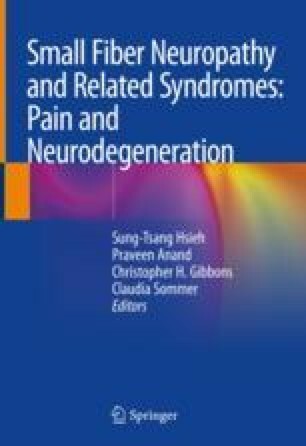 Contact heat-evoked potentials (CHEPs) are similar to LEPs with some practical advantages for clinical use, particularly when the region affected precludes skin biopsy, as it has been correlated with other techniques for assessing SFN including intraepidermal nerve fiber density (IENFD) in skin biopsies. They help in assessing patients unable to perform quantitative sensory testing (QST). However, LEPs/CHEPs may be reduced or absent in patients with CNS pain conditions and do not localize the abnormality to peripheral nerves. They can be helpful in distinguishing SFN from other conditions such as nonorganic pain or non-neuropathic hypersensitivity disorders, in which LEPs/CHEPs are preserved or even enhanced. Pain-evoked potentials are a useful tool for studying endogenous processing of emotional-motivational responses related to pain. They have been recommended in guidelines for the assessment of neuropathic pain.